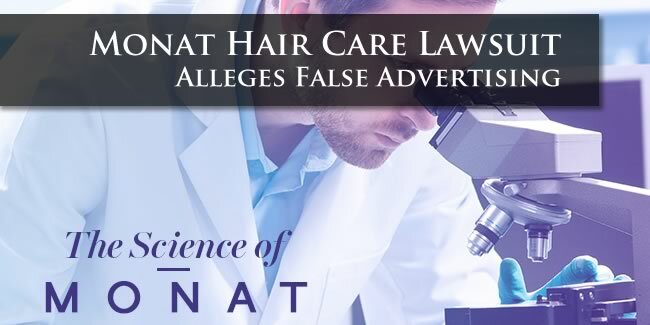 On July 13, 2018 Audet & Partners, LLP filed a class action lawsuit in the United States District Court for the Southern District of Florida based on widespread complaints suggesting that consumers were misled about the safety of hair care products distributed by Monat. For several years Monat has promoted its hair care products as “naturally-based” and “safe” in advertising and promotional materials. Monat’s widespread representations have gone beyond the safety of its products to include affirmative health benefits including the cessation of hair loss and the regeneration of new hair. The reality experienced by many users of Monat appears at odds with marketing representations made by the company. Serious problems experienced by Monat users have included scalp irritation and hair loss. While consumers have expressed widespread concerns to the company, Monat has typically deflected these concerns by stating that initial hair loss is part of a “detox” period before which the regenerative properties of the product become apparent; the company then suggests that consumers purchase additional product to carry through the “detox” period. As reported at Law360.c0m, the groundswell of complaints by Monat users is evidenced by a Facebook page entitled “Monat – My Modern Nightmare” that, according to the Complaint, has attracted thousands of followers. You can click here to view a copy of the Complaint filed against Monat. In addition, it appears as though Monat is distributed through a multi-level marketing structure that may in itself be proven illegal. If you have purchased and used Monat products and have experienced scalp irritation and/or hair loss, you are urged to contact Audet & Partners, LLP for a free, confidential case evaluation. You can contact us either by completing and submitting the inquiry form on the right side of this page, or by giving us a call at (800) 965-1461.